A dusting of islands that extends southwest from Florida’s mainland, the shallow waters and rocky coral of the Florida Keys are home to many historic lighthouses. On a drive down the Overseas Highway, you can make pit stops in search of Alligator Reef, American Shoal and Carysfort Reef lighthouses. Once you’ve arrived in Key West, you can explore the eponymous lighthouse located directly across the street from the historic Hemingway House, as well as offshore lighthouses, like Sand Key built seven miles south and Loggerhead Key and Garden Key built in the Dry Tortugas. Of course, the peninsular state of Florida enjoys miles of coastline, so lighthouses can be found as far north as Jacksonville and all along the Gulf of Mexico and Atlantic Ocean coasts. With a legacy of guiding ships safely into harbor, historic lighthouses tell the fascinating tales of Florida’s development, while offering sweeping bird’s eye views of their surroundings. Read on to learn more about the most historic lighthouses in Florida. 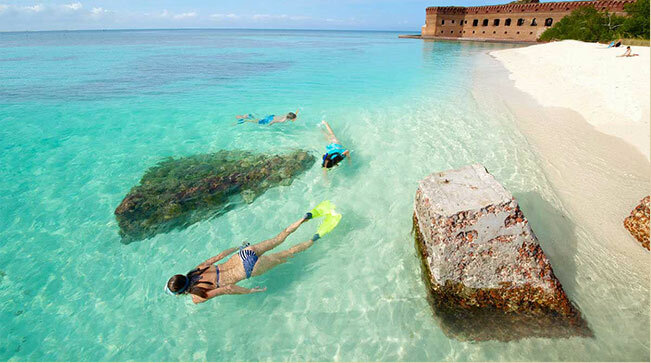 A cluster of islands 70 miles west of Key West, the Dry Tortugas were originally discovered by Ponce de Leon in 1513 during the Age of Exploration. In 1826, seven years after Spain ceded Florida to the United States, a lighthouse was built on Garden Key in the Dry Tortugas. At 65-feet, the conical brick lighthouse was designed to cover all of the islands of the Dry Tortugas and mark the harbor for ship entry. John R. Flaherty of Baltimore was the first lighthouse keeper. The lighthouse was critical for vessels transporting goods from the Mississippi River and the western coast of Florida, as well as during the three-decade construction of Fort Jefferson. Even after the establishment of the Garden Key Lighthouse in the Dry Tortugas, the islands still experienced problems with shipwrecks. It was determined that a second, more powerful lighthouse be built on Loggerhead Key approximately three miles west. First illuminated in 1858, the 150-foot lighthouse was built with a first order Fresnel lens inside a conical tower with a 203 granite block spiral staircase leading to the watch room and lantern room. The first head keeper was Benjamin H. Kerr who had previously worked at Garden Key. Today, the light is maintained by the Coast Guard. As the key’s name suggests, it’s still home to nesting turtles. Built on a sandy patch of the Florida Straits reef located near the channel seven miles south of Key West, the Sand Key lighthouse was first erected in 1827. It was destroyed several times by hurricanes and storms. The 109-foot screw pile foundation, which stands today, was built in 1853 and was the first to use a hydraulic lamp designed by George Meade. Today, it marks one of the most popular snorkeling destinations in Key West’s protected marine sanctuary. The first Key West Lighthouse was built in 1825 on what would become Whitehead Street in Old Town. However, it was destroyed in 1846 by the Great Havana Hurricane. A new 50-foot brick, conical tower with 13 lamps was built in 1848 and Barbara Mabrity presided as lighthouse keeper through the 1860s. In 1969, it was decommissioned by the Coast Guard and turned over to the Key West Arts & Historical Society. Today as the Key West Lighthouse & Keeper’s Quarters Museum, visitors can scale to the top of the lighthouse for bird’s eye views of Key West. While Cape Canaveral might be world famous for its rocket launches and space program, the Cape Canaveral Lighthouse holds historical importance to this community on Florida’s central east coast, as well. Originally built in 1848, the light warned ships of dangerous shoals just offshore. While the original light was deemed ineffective for navigators sailing into shore, a second light was commissioned in 1860 at 151-feet tall and was completed in 1868. The conical tower, made of cast iron plate lined with bricks, was eventually moved about a mile west due to erosion and today is located inside the Cape Canaveral Air Force Station. Not only is St. Augustine the oldest continually occupied city in Florida, it’s also home to Florida’s first lighthouse built in 1824. However, archival records suggest that under Spanish occupation a lighthouse stood here as early as 1737. At 165-feet tall, the tower that stands today was built in 1874 with a first order Fresnel lens and presided over by lighthouse keeper William A. Harn of Philadelphia. Today, part of the National Register of Historic Places, it’s part of the St. Augustine Lighthouse & Maritime Museum.